Whenever I want to be inspired by great food, I always turn to my blogging friends first. 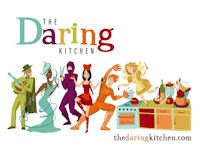 I'm constantly amazed by their talent and passion for creating delicious works of culinary art in their kitchens. When it comes to Greek food, the place I look to first is my friend Peter's blog. (http://www.kalofagas.ca/) If you love Greek food you need to go there. Actually, I think you should go there now. Go ahead, I'll wait. For my friend Jake's birthday, we wanted to have a Greek dinner to celebrate. Jake loves his cigars and I immediately thought of Peter's Baklava Cigar recipe. The birthday boy loved them and so did everyone else. They were delicate, sweet and sticky. Everything a Baklava should be - absolutely delicious. Enjoy! 1. Prepare your syrup by adding your water, sugar, honey and bring to a boil. Simmer for 10 minutes. Now add your lemon juice and bring to a boil then simmer for another 10 minutes. Set aside. 2. In a food processor, add your walnuts, sugar, cinnamon and cloves and pulse into a crumbly, grainy consistency. Set aside. Take your phyllo out of the fridge and allow to come to room temperature (15 minutes). Pre-heat your oven and have melted butter ready. 3. Cut your phyllo vertically into 4 equal strips. Layer 2 strips of phyllo, both brushed with some butter. 4. Sprinkle one heaping Tbsp. of of nut filling all over the surface of the phyllo (save for the perimeter). 5. Fold the bottom lip of phyllo in and then fold the 2 horizontal sides in. Now roll-up your your phyllo (slightly taute). 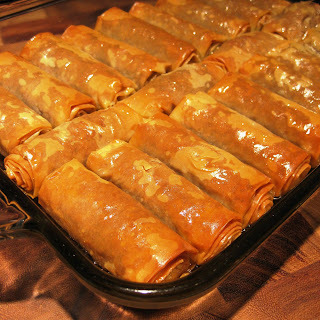 Place the baklava cigar seam-side down into your buttered baking vessel (about 2-inches deep). Repeat with remaining phyllo until your ingredients are used up. 6. Brush the tops of your baklava cigars with melted butter and place in your pre-heated (350 degree) oven for 3o-35 minutes or until just golden. 7. Your syrup should be cool and your pastry is hot, just out of the oven. Pour the syrup over your cigars and allow the syrup to be absorbed and allow to cool before serving. 8. Store in cool place inside an airtight container for up to 2 weeks. Paula - these look incredible. :) I can't wait to try them sometime! Paola, you did a wonderful job making the Pourakia (Bakalava cigars). They are an easier riff on classic Baklava an every bit as delish. I'm sure they are all gone! OMG, that look ever so scrumptious! They look so golden, crispy and delicious! I really enjoyed all your Greek food pics on Twitter. I have awards for you on my blog. I love that crispy look of your baklawa. Looks so delicious! I did my share of Baklava too last for the new year...Irrestible isnt it?Cigars is a nice idea..Will try this way next time. I've GOT to remember this the next time I'm hankering for baklava. Love the cigar idea.